After the longest beta programme since time began, the new release of Crystal Reports Server (now just Crystal Server) was finally released to shrink-wrap last week. I’ve checked my diary, and this is almost 6 months since the ‘release’ date! Off the record, it’s nearly a year since I was told to expect the release. Let’s hope the time was well spent! There are plenty of places to see list of new features, so I’m not going to repeat that here. I’m going to give my first impressions from the perspective of an independent consultant who’s been working with Crystal for most of his adult life.Yes, it’s supposed to be slightly irreverent. I’ll follow up this blog with actual usability stuff once I’ve had feedback from my customers about their experiences, and I’ve had some time to do ‘real work’ rather than just playing. Service Pack 2?! Isn’t this fresh off the press? OK, so select customers have been running BI 4.0 since early this year, so maybe it’s a sign that this is mature software. But two service packs in 6 months? I’m glad I wasn’t running the original release. On the other hand, imagine if Microsoft release Windows 8 this time next year after a 6 month testing phase with select customers. The first shrink wrap installs as Windows 8 SP2. Imaging the howls of derision! Let’s give SAP the benefit of the doubt for now. It’s also version 14 – so superstitious to skip 13, or maybe the delay is due to my sleeping through version 13? 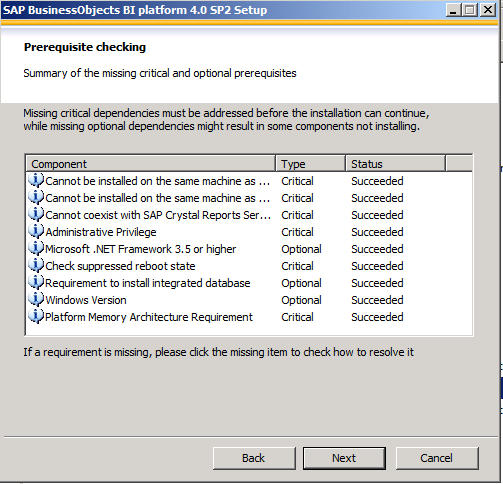 I’ve always liked the way that Microsoft have checks for pre-reqs when you install software. Saves so much pain and reconfiguration later. Nice to see this here, I lose count of the number of times I send a list of pre-reqs to a customer before an installation to find they’ve not been done – this should save a lot of time. Tucked away in the very flexible installation options is the .Net SDK. I do a lot of .Net development, so after the missing SDK in the V0 release of Crystal Reports Server 2008, and the knowledge that there was no .Net version of the new InfoView, I was concerned. There is a 32 bit version too, as a separate install. I assume this is due to the tiff between SAP and Oracle. 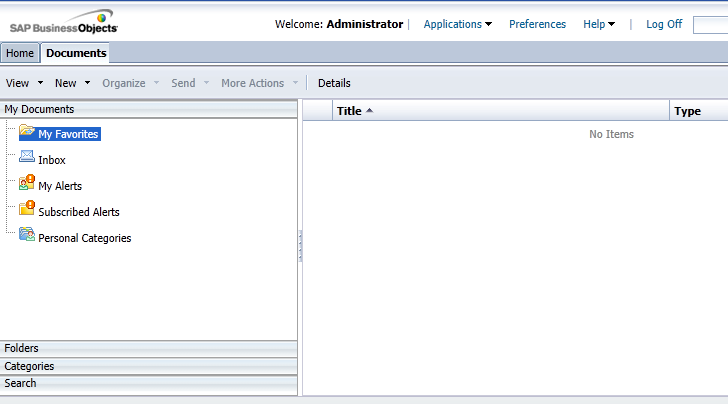 Oracle own MySQL, so SAP have dropped MySQL from the installer. Before anyone launches into ‘Open source is the answer’, ask yourself one question – how many small companies who did their own installation of Crystal Reports Server 2008 have the slightest idea how to backup a MySQL database? Even if they already have MS SQL, chances are they don’t know how to create a new system database, so they just keep clicking next and end up with a system they never backup. Thank you SAP (and I don’t say that very often). There a various options – version control and diagnostics. I’ve not had time to even check the licensing agreements, so won’t get excited just yet. Version control has been a frustrating omission for too long, so glad to see something appear. Now all I need is proper control of publishing – reports available from, to etc. Nothing but good news here so far – it hasn’t really changed. After the massive changes of the last release, it’s good to see that tasks are done in pretty much the same way. There is new stuff, but the old stuff can be done in the same way. I’ve not worked through any proper workflow yet, so I don’t know if I’ll still be playing ‘hunt the option’ between the ‘Action’ and ‘Manage’ menus, or wondering whether or not rightclick will give me a context sensitive menu or the browser options. Hopefully, that’s all been fixed. Nothing in favourites, nothing in inbox, etc, etc. We;re back in the land of Crystal Enterprise 8.0, playing hunt the link. Keep looking, and you’ll see Folders at the bottom, click that and you’re back in the familiar territory of your report folders. I know that I can change all these defaults centrally, but for the default to hide all your reports is just silly. On balance, I feel positive about the new release, hopefully that feeling will continue. When I get time, I’ll write some more. We've moved This blog is no longer maintained as it’s now hosted as part of our main site. Please head over.